“I Love Your New Book, A Ghost in My Suitcase. It’s The Best I’ve Ever Read! I’ve Read It 5 Times And Reading it A 6th Now! When Celeste travels to China to visit her grandmother, she uncovers an incredible family secret. And with this secret comes danger and adventure. If Celeste is to save her family and friends, she must learn to harness her rare and powerful gift. During school visits I often get asked who my favourite characters are. The truth is, I like all my characters, even the really nasty ones. But sometimes a character quietly demands to be the star of their own book. This is what happened with the grandma character, Por Por, in a previous book of mine called The Pearl of Tiger Bay. She is a ghost-hunter and I love her for her quirkiness, her intelligence and wisdom. She is old and suffers from dementia and yet her ghost-hunting skills are still so powerful. I got to wondering about her life in China before she migrated to Australia. Where did she live? Where did she learn her ghost-hunting skills? What was her childhood like? Who did she marry? All these unanswered questions lead me to write A Ghost in My Suitcase. This novel, therefore, is a prequel to The Pearl of Tiger Bay. The next thing I had to consider was setting. Setting is very important to me because I see every scene in my mind as if I am watching a movie. Three years ago, I visited the ancient water town of Wuzhen. It has a history of two thousand years. I knew this was the perfect place to base a ghost story around with its dark alleyways, quaint wooden houses standing in water, beautiful moon bridges and winding canals. There is a long history of ghost-hunting in China. These sorcerers use special swords, mirrors, hand signs and talismans to trap their prey. I have used the equipment and methods of catching ghosts from books that I have read on the subject and combined these facts with my imagination. The young heroine in the novel is called Celeste. Celeste is a name I have always liked probably because, when I was first learning to talk, my mother would have me repeat it over and over again. She thought the way I said it was cute. It is also appropriate because my heroine is half French, half Chinese. Much of what I write is from personal experience and none more so than the chapter in the book called “It’s Raining, It’s Pouring”. In the 1980’s I studied Chinese painting at the Zhejiang Academy of Fine Art, Hangzhou. That summer, we were taken on a field trip to Wuyi Mountain in Fujian Province. The experience of the bus ride through the mountains was one I will never forget. Who has ever heard of putting up an umbrella inside a bus to shelter from the pouring rain, or frogs plopping around your feet on the wet floor, or a piglet in the arms of one of the passengers, or a man climbing on board with a bark cape, woven bamboo hat and two baskets of ducks? I could never have imagined such a bizarre scene. Life is certainly stranger than fiction. A box of magic pastels, a garden of healing, a fox spirit, a mystical Chinese monastery, a fantastical weather-controlling beast, a water town full of ghosts, and a ghost-hunting granny are but a few of the ideas I have used in my stories. One cannot help but be influenced by one’s heritage and so I have drawn on mine, delving into the history, philosophy and folk tales of China, and combining these elements with my imagination to write my novels. At the same time, they act as a vehicle to convey my thoughts on deeper human issues. 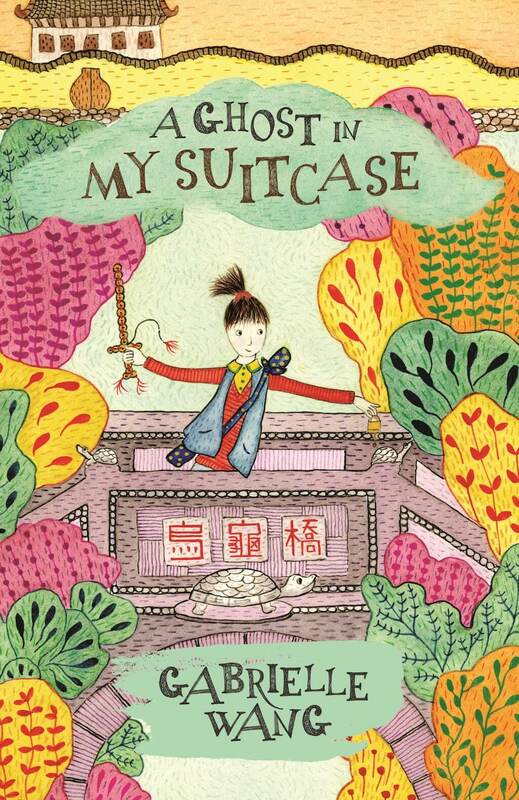 A Ghost in My Suitcase is about loss and healing, the importance of family and friendship, finding the strength within to overcome emotional and physical difficulties, and the value of older generations in the passing on of knowledge. But it is also a ghost story. The idea grew out of a previous novel of mine called The Pearl of Tiger Bay. Por Por (the word for maternal grandmother in Chinese) is a ghost-hunter and was only a minor character in that story. But she had such a strong personality with her humour, quirkiness and courage that she called out to be the star of her own book. I began to wonder what her life might have been before she migrated to Australia. What was her childhood like? What happened to her husband? How had she become a ghost-hunter? What had been her trials and tribulations? Who was she really? One of the wondrously mysterious things about writing – and there are many – is that even though the characters are pure inventions, once conceived, they really do take on a life of their own. It is as if, once written into existence, they become real living people who feel free to dictate how the story goes. In fact, all the characters I have invented have become dear friends of mine, even the bad ones. Therefore I cannot really take credit for inventing Por Por. I provided the mould, she did the rest herself. Then there was the setting. Shanghai and the water towns in Zhejiang seemed perfect for a ghost story. While I was living in China studying at the Zhejiang Academy of Fine Art, I often visited Shanghai. This place is haunted by the many ghosts of the past. After losing the Opium wars in the mid 1800’s, China was forced to concede large parts of Shanghai first to Britain, then later to the French, the Americans and the Japanese. In these concessions, Chinese law was powerless. The foreigners built western style mansions, played polo and tennis, ate European food and shopped for western goods in western style shops and Emporiums. They lived and died in an artificial Europe, surrounded by the overwhelming reality of China, its beauty and its squalor. Wu Zhen, the water town I based the Isle of Clouds on, is an example of this beauty with its narrow flagstone alleys and wooden stilted houses lining canals upon which graceful boats slip to and fro. It is very easy, as there are no cars in Wu Zhen, to imagine yourself there, walking around with the ghosts of a thousand years ago. And now to my heroine, Celeste – a twelve year old who is embarking on an incredible journey taking her mother’s ashes home to China. In the first few drafts, Celeste was half Chinese, half Italian and her name was Isabella. But then I thought it would be interesting to use the French concession in Shanghai as a backdrop, with its colourful history and its many ghosts, so I changed her name to Celeste. And now you will find that she is half French, half Chinese. Writing is all about going with the flow. There are three things I know for certain when I begin a novel. Everything else is left up to choice. I make hundreds of small decisions everyday to do with plot, voice, characters, sentence structure, words, and punctuation. That’s why, even if it is a rather lonely existence, I will never tire of writing stories. Of course, I always have my characters to keep me company. And now this book is travelling beyond my wildest dreams. The play by Barking Gecko Theatre has had its Melbourne season. Next stop The Sydney Opera House!